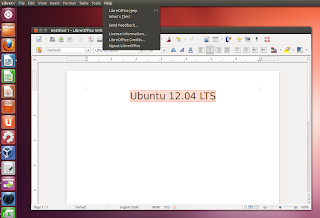 Ubuntu 12.04 LTS Precise Pangolin has been released and many of you have already upgraded or plan on upgrading, so I've made yet another post that you'll hopefully find useful, with things that you may want to tweak, fix or install in Ubuntu 12.04. 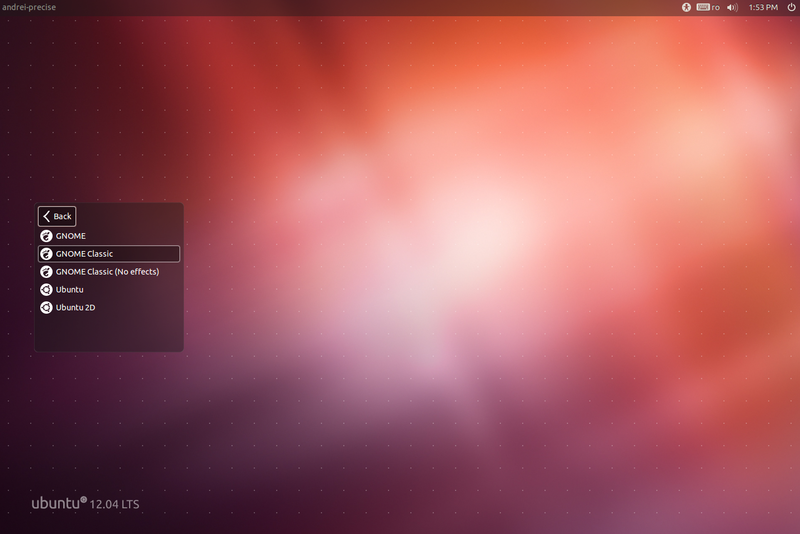 Some of the tweaks in this article are old, and we've already talked about it in the previous posts about things to tweak after installing Ubuntu 11.10 or 11.04, but there are also many new things to install and tweak and also, some improved old tweaks. If you're new to global menus or overlay scrollbars, give them a try for a few days before disabling them. If until now, you had to modify configuration files or run various commands to disable the global menu (appmenu), the overlay scrollbars or whitelist the systray, this time things got a lot easier thanks to some tools such as Unsettings. So those of you who don't like the global menu, overlay scrollbars or want to whitelist the systray so applications that use a notification area icon show up on the Unity panel, can use Unsettings to change these settings with a click. 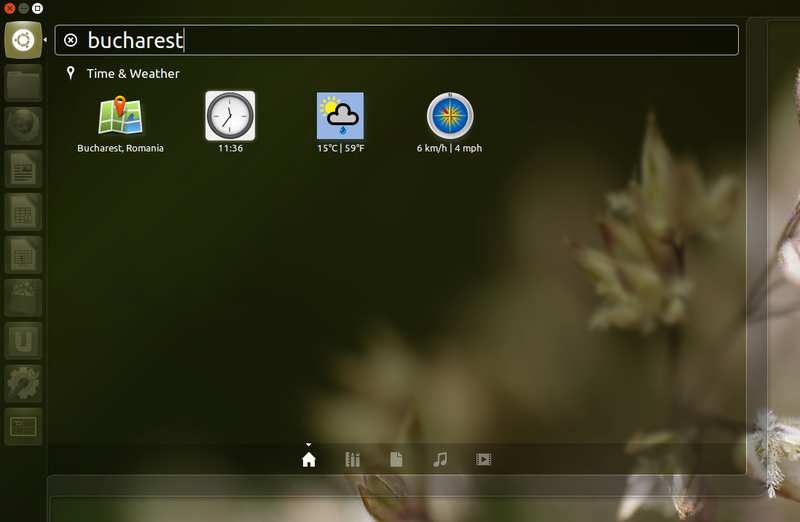 Change GTK, Window, Icon and cursor themes. Unsettings isn't the only such tool, there's also MyUnity and Ubuntu Tweak, each with some common but also some extra features. 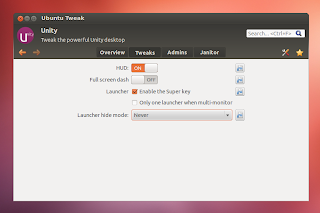 Unsettings and MyUnity are nice for Unity 3D, but they lack proper support for Unity 2D so to easily tweak Unity 2D, you can install Ubuntu Tweak, which lets you enable / disable HUD, set Dash to full screen, change the launcher autohide (this is also available in System Settings, under Appearance) and multi-monitor behaviour. 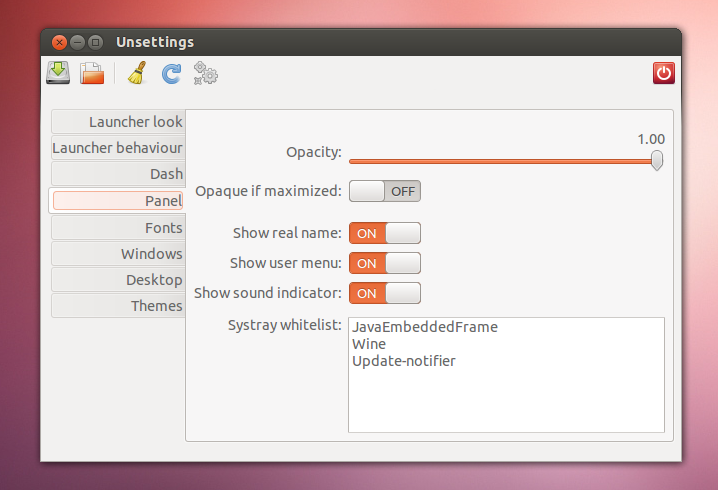 The 'Dodge Windows' / 'Dodge active window' Unity launcher autohide behaviour has been removed from Ubuntu 12.04 Precise Pangolin but you can get it back using a patched Unity. This patched Unity also adds minimize/unminimize on click for the Unity launcher as well as an option to disable application menu (global menu) autohide. 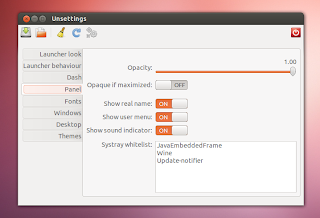 To disable global menu autohide, open CompizConfig Settings Manager (CCSM), select "Ubuntu Unity Plugin" and on the "Experimental" tab, check the box next to "Menu Always Visible" (it's not checked by default). More info @ HERE and HERE. The Unity 3D launcher icon size can easily be changed through System Settings (under Appearance), but that's not available for Unity 2D. But there is a way to change the Unity 2D launcher icon size: through a script. In the last command above, replace "SIZE" with the desired size for the launcher icons, for example "32" (don't use any quotes). Then log out and log back in to Unity 2D. Quite a few Unity lenses have been created in the last few months. The lens I find most useful is called Recoll Lens which lets you use Recoll, a full text search tool, from Dash, without having to open any additional GUI. The lens comes with a few filters like Text, Spreadsheet, Presentation, Media or Message, but for more advanced searches, you'll have to manually enter the Recoll search query. Examples: author:"john doe", metallica OR megadeth, /2007 (all documents from 2007 or older), dir:/path/to/dir (filters content from /path/to/dir directory) and more. More info about Unity Recoll Lens. These are just the lenses I find most useful, but there are many others, like torrent search lens, Grooveshark or Spotify lens (available in the same PPA as the Cities and Calculator scopes) and more. 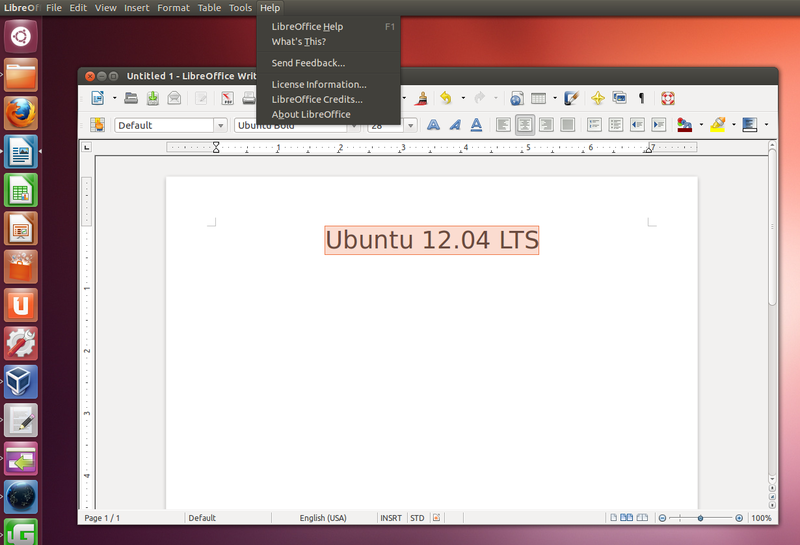 See here for more lenses and also search for new lenses and scopes in the Ubuntu Software Center. AppIndicators are applications that come with an indicator displayed on the top Unity panel (or on the Classic GNOME panel). 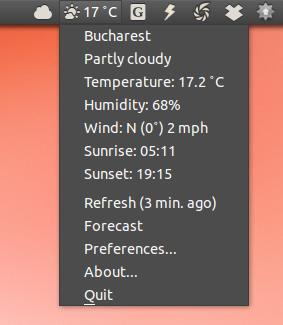 Weather Indicator displays the weather on the panel, from one or multiple locations around the world. You can configure it to display notifications and more. Thunderbird is now the default email client so if you want to synchronize Google Calendar with Thunderbird, see: How To Synchronize Google Calendar With Thunderbird. Zeitgeist displays your most used and recently used files and applications in Dash, which is something many of you might not want. But starting with Ubuntu 12.04, Activity Log Manager has been integrated into System Settings so you can blacklist certain file types, folders or applications from showing up in Dash. You can also use it to clear the Zeitgeist history for a period of time or completely. 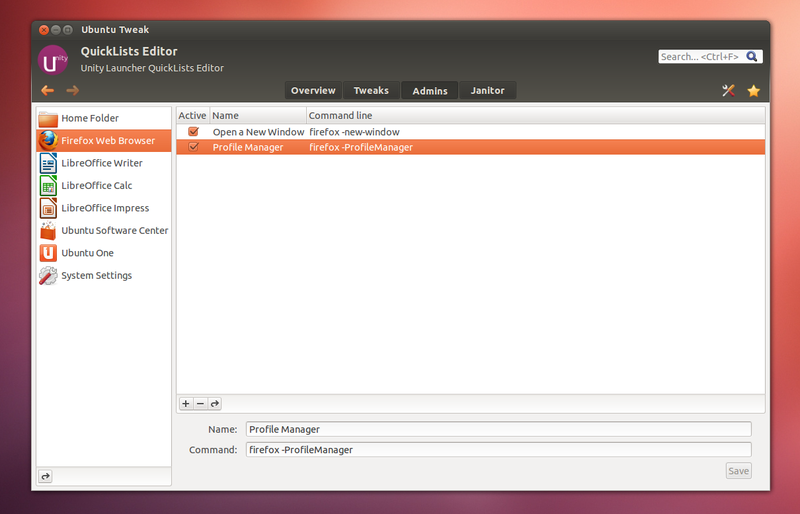 To access Activity Log Manager, open System Settings and click on "Privacy". On the "Recent items" tab you can clear the Zeitgeist history or disable it completely. For more control, check out the other tabs: on the Files tab, you can blacklist some directories or file types and on the Applications tab you can blacklist some applications that you don't want to show up in Dash. 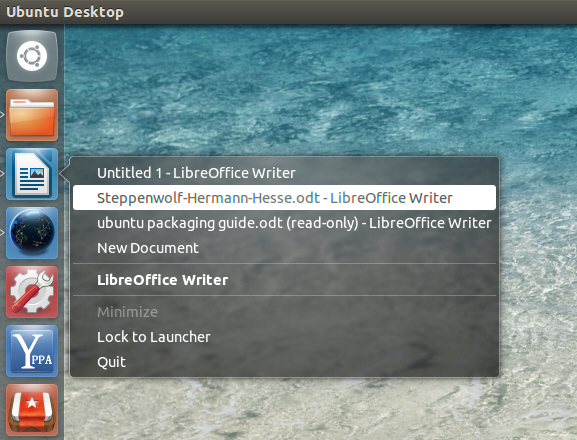 This doesn't just add global menu support for LibreOffice, but it also makes HUD, the new smart menu which can be accessed by tapping the ALT key, work with LibreOffice. 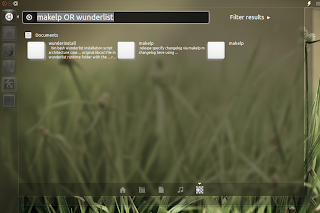 Unity Window Quicklists displays a list of open windows as quicklists for each application on the Unity launcher, and you can use them to switch between those windows. The quicklists are dynamic, meaning that when a window is closed or a new window is open, the quicklists are instantly updated. Quicklists are menu items that show up when right clicking an icon from the Unity launcher. 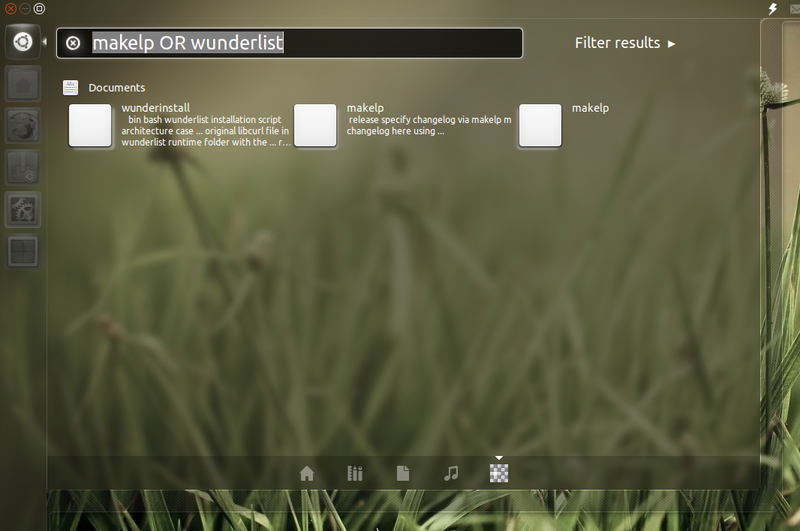 In Ubuntu 12.04, many applications now have quicklists but there are of course some without this useful addition so if you want, you can create your own quicklists, easily, using either Ubuntu Tweak or MyUnity. in MyUnity, click on the "launcher" tab, and right under the launcher text there should be a link called "quicklists". 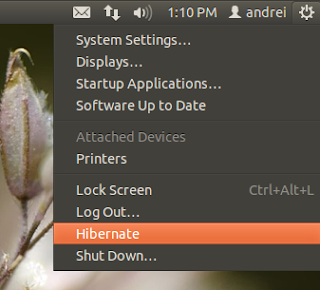 Hibernate has been disabled by default in Ubuntu 12.04. You can use 'suspend' instead, but if you want hibernate back, there is a way to do it. But firstly, what's the difference between hibernate and suspend? When using suspend, the computer disconnects everything everything except for RAM so it's still using a bit of power. Hibernate on the other hand saves everything to the hard disk, so the computer doesn't need any power, which is important for laptops and netbooks. Your computer should switch off - turn it back on and all the applications you had open should reopen if hibernate works for your computer. After logging out and logging back in, "Hibernate" should show up in the power menu. 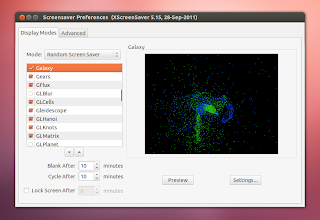 Then search for "Screensaver" in the menu and tweak its settings to your needs. To add Xscreensaver to startup, open Startup Applications and add "xscreensaver -nosplash". To get CTRL + ALT + L to lock the screen and start the screensaver, go to System Settings > Keyboard and on the "Shortcuts" tab, under "System", change the "Lock screen" keyboard shortcut from CTRL + ALT + L to something else, then under "Custom Shortcuts", click the "+" button to add a new custom shortcut, under "Name" enter "Xscreensaver" and under "Command" enter "/usr/bin/xscreensaver-command -lock", then click "Apply". If you've used the alternative method to assign CTRL + ALT + L to Xscreensaver lock screen, open System Settings > Keyboard again, remove the custom Xscreensaver command and assign CTRL + ALT + L back to "Lock screen" (under "System"). In case the installation doesn't work (it sometimes fails when behind a proxy), you can try to manually install Oracle Java 7. 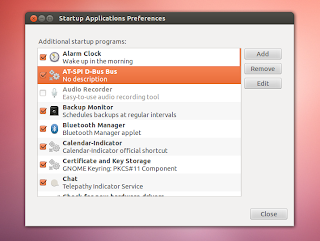 If you want to make Gdebi default, right click a .deb file, select "Properties", go to the "Open With" tab and select "GDebi Package Installer" instead of "Ubuntu Software Center". Click "Close" and double click the .deb file - it should now open with GDebi and not Ubuntu Software Center. 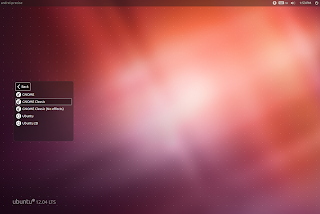 When you upgrade to a new Ubuntu version, all the PPAs are disabled. The "Re-enable working PPAs feature checks if the old PPAs have been updated to work with your current Ubuntu version and if they do work, it re-enables them. 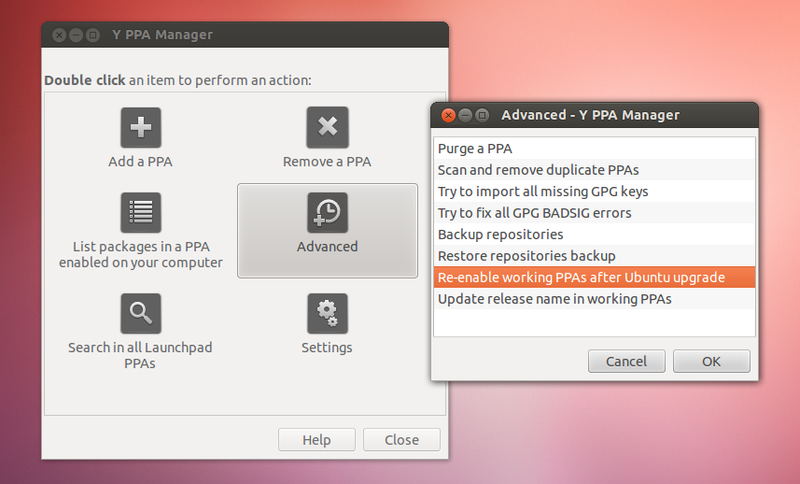 If you've just upgraded from Ubuntu 11.10 or 10.04 and want to re-enable the PPAs that work with Ubuntu 12.04, you can use Y PPA Manager to do this automatically. 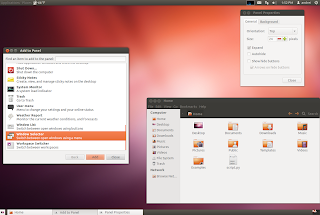 Make sure your Internet connection is working, then in Y PPA Manager select Advanced > Re-enable working PPAs after Ubuntu upgrade" and all the PPAs that have packages for Ubuntu 12.04 will be enabled automatically, leaving the others disabled. If you want to do a clean Ubuntu 12.04 install, you can make a backup for the PPAs you had on your previous Ubuntu installation using Y PPA Manager, then restore the backup using Y PPA Manager on Ubuntu 12.04 and update the release name in those PPAs that work with Ubuntu 12.04 (so if a PPA has packages for Ubuntu 12.04, it will be updated to use "precise" in the .list file instead of the previous version). To do this, in Y PPA Manager select Advanced > Update release name in working PPAs. Before any of the above tasks, make sure you make a backup using Y PPA Manager or manually. It's because you're trying to install the Dropbox .deb downloaded from the official Dropbox website, and it currently can't be installed in Ubuntu 12.04. But you can simply install Dropbox by searching for it in Ubuntu Software Center / Synaptic - that package should install without any issues. 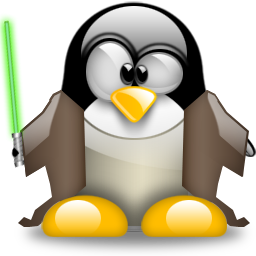 If you don't like Unity (either the default Unity which uses Compiz or Unity 2D), you have many alternatives available, while continuing to use GNOME. 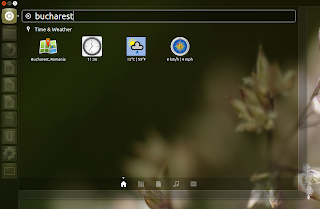 I will only talk about official alternatives which are available in the Ubuntu repositories, but in case you don't like them, there's also Cinnamon, a GNOME Shell fork that uses a GNOME2-like layout and Mate, or you can use a different Ubuntu flavor like Xubuntu, Lubuntu or Kubuntu. 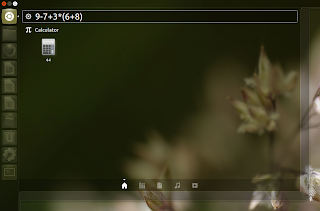 If you prefer the old GNOME 2 layout, you can install the classic (also known as fallback) GNOME session in Ubuntu 12.04 - you'll get almost the same look as in GNOME 2: Ubuntu AppIndicators and the default indicators (Messaging Menu, Sound Menu and so on), Compiz and panel applets. 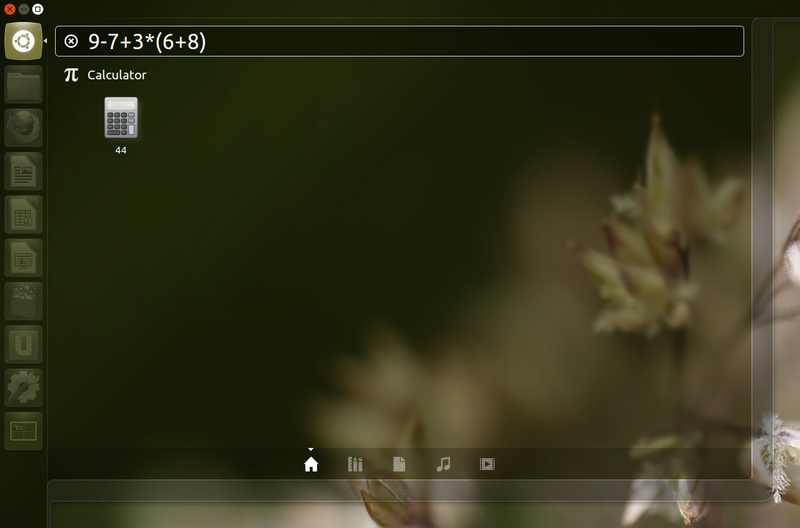 Note: to be able to access the GNOME panel settings or add applets, you need to hold the ALT key and right click the panel instead of simply right clicking it, as it used to be in GNOME 2. 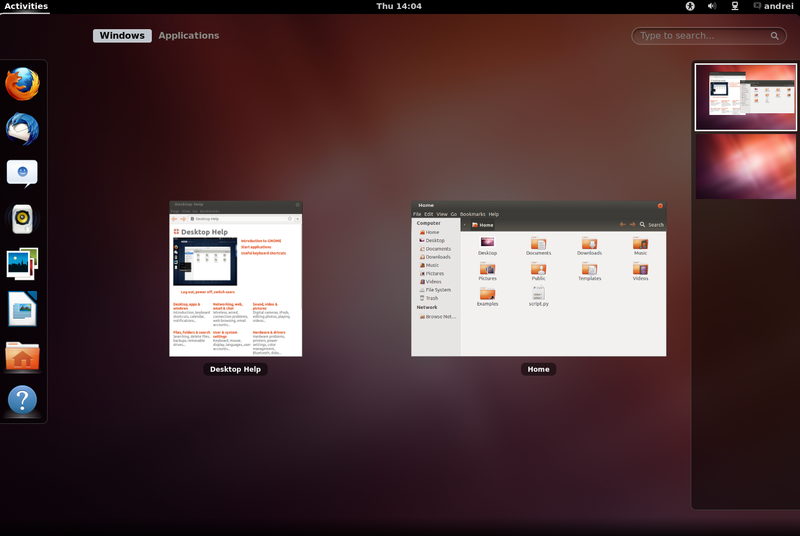 And then select "GNOME" from the login screen. 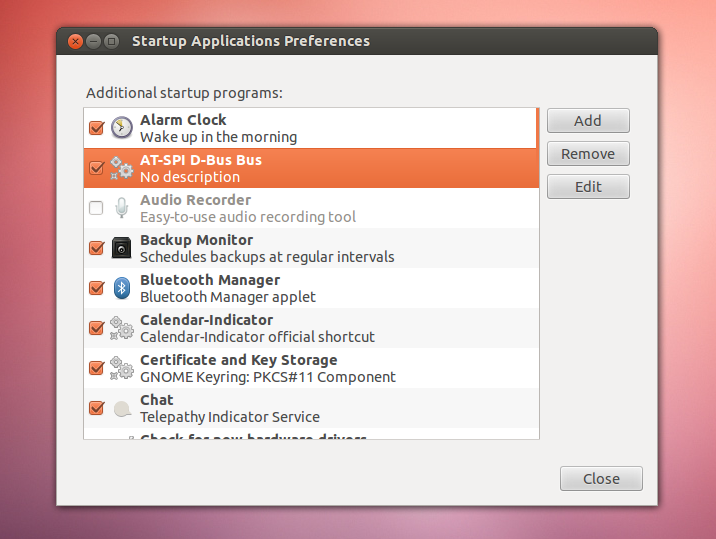 Then restart GNOME Shell (ALT + F2 and enter "r" or log out and log back in) and use GNOME Tweak Tool to activate the extensions you want to use. And of course, there's also the GNOME Shell extensions website which offers a huge list of extensions that you can install with a click. Note: you need to use GNOME Shell to be able to see the available extensions and install them. This post is still work in progress and more tweaks and tips will be added later on, so make sure you keep an eye on it. Oh, and if you have a suggestion for something that you think should belong here, lets us know in the comments!